There are a wide variety of stepper types, some of which require very specialized drivers. For our purposes, we will focus on stepper motors that can be driven with commonly available drivers. These are: Permanent Magnet or Hybrid steppers, either 2-phase bipolar, or 4-phase unipolar. One of the first things to consider is the work that the motor has to do. As you might expect, larger motors are capable of delivering more power. 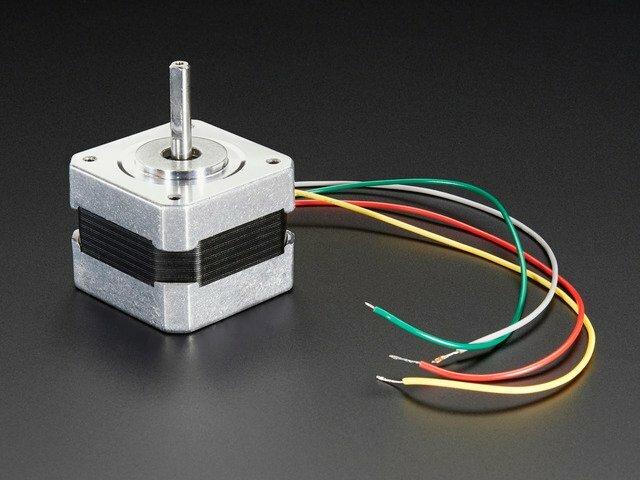 Stepper motors come in sizes ranging from smaller than a peanut to big NEMA 57 monsters. Most motors have torque ratings. This is what you need to look at to decide if the motor has the strength to do what you want. NEMA 17 is a common size used in 3D printers and smaller CNC mills. Smaller motors find applications in many robotic and animatronic applications. The larger NEMA frames are common in CNC machines and industrial applications. The NEMA numbers define standard faceplate dimensions for mounting the motor. They do not define the other characteristics of a motor. Two different NEMA 17 motors may have entirely different electrical or mechanical specifications and are not necessarily interchangeable. The next thing to consider is the positioning resolution you require. The number of steps per revolution ranges from 4 to 400. Commonly available step counts are 24, 48 and 200. Resolution is often expressed as degrees per step. A 1.8° motor is the same as a 200 step/revolution motor. The trade-off for high resolution is speed and torque. High step count motors top-out at lower RPMs than similar size. And the higher step-rates needed to turn these motors results in lower torque than a similar size low-step-count motor at similar speeds. Another way to achieve high positioning resolution is with gearing. A 32:1 gear-train applied to the output of an 8-steps/revolution motor will result in a 512 step motor. A gear train will also increase the torque of the motor. Some tiny geared steppers are capable of impressive torque. But the tradeoff of course is speed. Geared stepper motors are generally limited to low RPM applications. Round or "D" Shaft: These are available in a variety of standard diameters and there are many pulleys, gears and shaft couplers designed to fit. "D" shafts have one flattened side to help prevent slippage. These are desirable when high torques are involved. Geared shaft: Some shafts have gear teeth milled right into them. These are typically designed to mate with modular gear trains. Lead-Screw Shaft: Motors with lead-screw shafts are used to build linear actuators. Miniature versions of these can be found as head positioners in many disk drives. 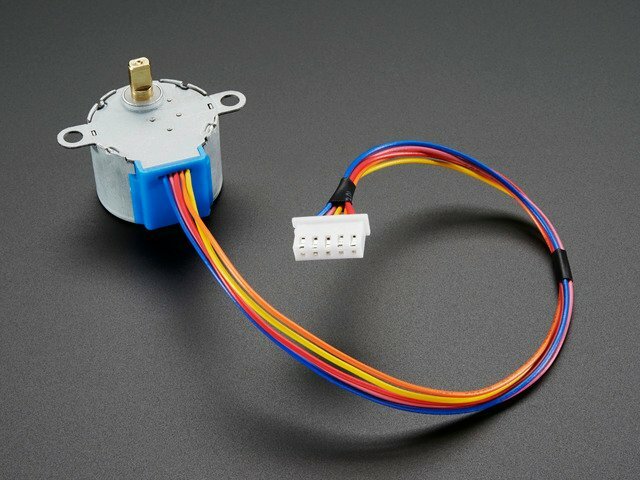 There are many variations in stepper motor wiring. For our purposes, we will focus on steppers that can be driven with commonly available drivers. These are Permanent Magnet or Hybrid steppers wired as 2-phase bipolar, or 4-phase unipolar. A stepper motor may have any number of coils. But these are connected in groups called "phases". All the coils in a phase are energized together. Unipolar drivers, always energize the phases in the same way. One lead, the "common" lead, will always be negative. The other lead will always be positive. Unipolar drivers can be implemented with simple transistor circuitry. The disadvantage is that there is less available torque because only half of the coils can be energized at a time. Bipolar drivers use H-bridge circuitry to actually reverse the current flow through the phases. By energizing the phases with alternating the polarity, all the coils can be put to work turning the motor. A two phase bipolar motor has 2 groups of coils. A 4 phase unipolar motor has 4. A 2-phase bipolar motor will have 4 wires - 2 for each phase. Some motors come with flexible wiring that allows you to run the motor as either bipolar or unipolar. This style is common in smaller unipolar motors. All of the common coil wires are tied together internally and brought out as a 5th wire. This motor can only be driven as a unipolar motor. This motor only joins the common wires of 2 paired phases. These two wires can be joined to create a 5-wire unipolar motor. Or you just can ignore them and treat it like a bipolar motor! 4-phase unipolar - All the common wires are connected together - just like a 5-wire motor. 2-phase series bipolar - The phases are connected in series - just like a 6-wire motor. 2-phase parallel bipolar - The phases are connected in parallel. This results in half the resistance and inductance - but requires twice the current to drive. The advantage of this wiring is higher torque and top speed. 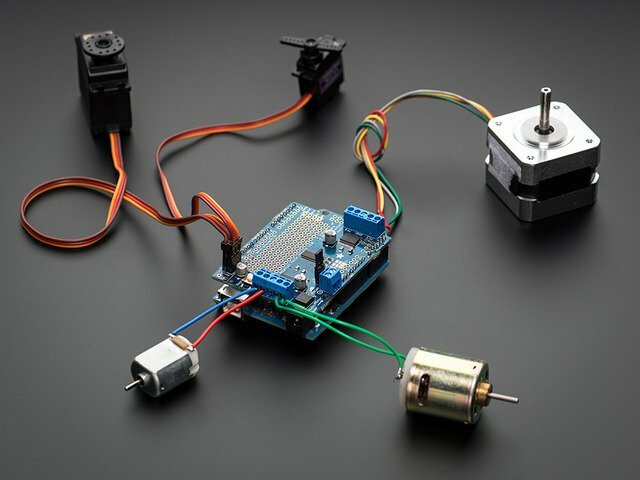 Driving a stepper motor is a bit more complicated than driving a regular brushed DC motor. Stepper motors require a stepper controller to energize the phases in a timely sequence to make the motor turn. 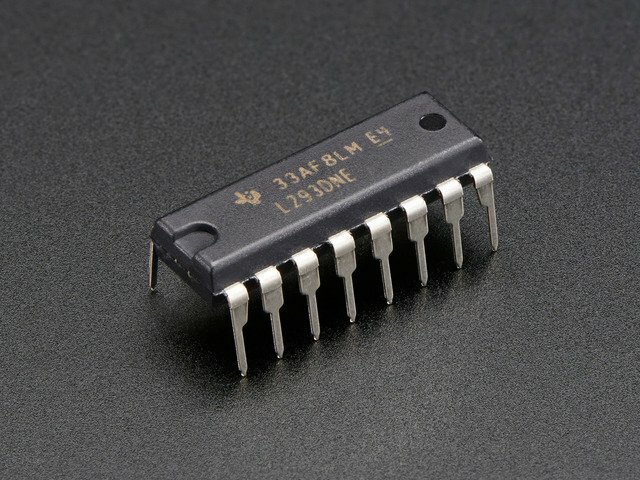 The simplest type of driver can be built with a handful of transistors. These are simply switched on and off in sequence to energize the phases and step the motor. Unipolar drivers are relatively inexpensive to build, but only work with unipolar motors. There is an excellent tutorial on how to build one at the Arduino site. Driving a bipolar motor requires 2 full H-bridges so it can reverse the current to the phases. H-bridges can be tricky to build from scratch. But there are plenty of H-bridge chips available to simplify the task. 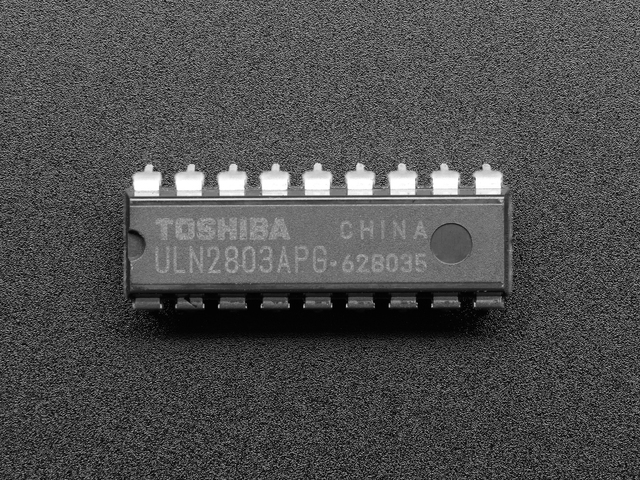 The L293D is one of the most popular and economical chips. These can be found at the heart of most first-generation motor shields, including the incredibly popular V1 Adafruit Motor Shield. The Adafruit Motor Shield V2 is a big step up from the basic L293D based controllers. The V2 shield uses two TB6612 MOSFET drivers. Compared to the L293D, the TB6612 offers twice the current capacity and much lower voltage drops to drive your steppers more efficiently. 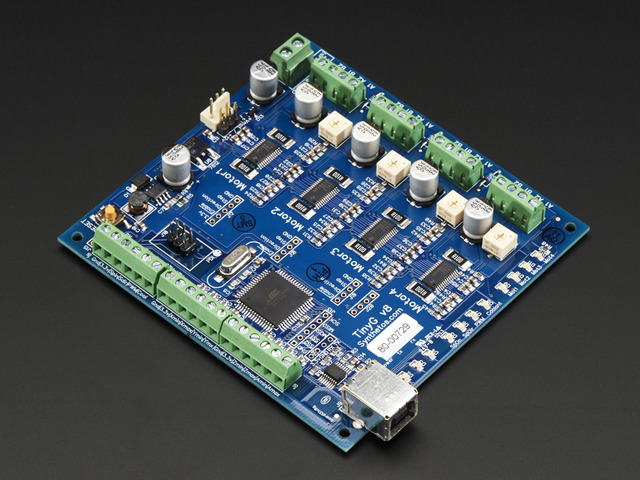 With 2 driver chips and 4 full H-bridges total, each shield can drive up to two stepper motors. The driver chips are interfaced via a dedicated PWM driver chip with an I2C interface. This frees up lots of GPIO pins for other uses, and makes the shield stackable too. You can stack up to 32 of them to control 64 motors with just 2 IO pins! Compete details of this driver can be found in the Learning system. The gShield and TinyG CNC controller boards take you one step closer to industrial level stepper performance. These boards feature constant-current "chopper" drivers that can be tuned to deliver maximum torque and speed from your motors. The TinyG CNC features an on-board G-code interpreter and 4 motor outputs making this a complete embedded solution for a small to medium sized 4-axis CNC machine. As you might expect, these advanced, high-performance boards are more complex to work with and are recommended for experienced users. Details on these boards and their operation can be found in the TinyG Wiki and the Synthetos Forums. 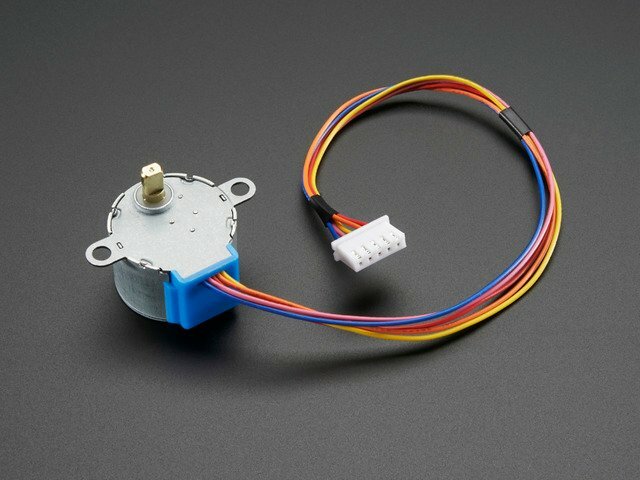 Now we come to the most important part: making sure that your motor and driver are compatible. Mismatched motors and drivers can result in disappointing performance. Or worse: damage to the motor and/or controller. Voltage - The maximum voltage that the driver can supply to the motor. Continuous Current - The maximum current that the driver can supply to the motor. "Peak" current ratings are not applicable to stepper motors. Always go by the "continuous" current rating. Amps per phase - This is the maximum current that the motor windings can handle without overheating. Resistance per phase - This is the resistance of each phase. A Voltage rating is often stated. It is usually calculated from the two above - but not always. It is better to calculate yourself from the above parameters using Ohm's Law. Stepper motor phases are inductors, so they will resist rapid changes in current flow. But at the end of each step or when not moving, they behave like a purely resistive load and will behave according to Ohm's Law. Standing still is also when a stepper motor draws the most current. So Ohm's Law allows us to use the motor specifications to calculate the current requirements of the driver. These formulas should be strictly applied for all "constant voltage" stepper controllers. 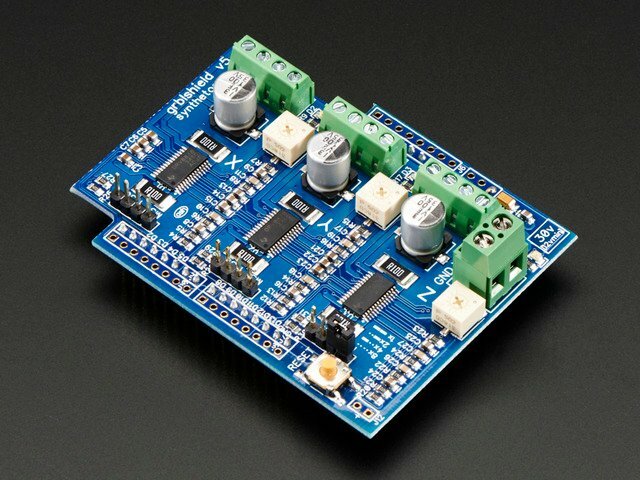 This includes both V1 and V2 Motor Shields from Adafruit, and virtually all other L293D based controllers. But some motors have very low coil resistance. Strictly following those formulas, the drive voltage will be less than 5v and performance will not be good. This type of motor is not a good match for a constant-voltage driver. These steppers require a more specialized controller. It is not possible to cheat Ohm's Law. If you try, you will have to answer to the Blue Smoke Monster. However, there are some other laws at work here. The expertise at the law firm of Lenz, Faraday and Ohm can help you to increase the performance of your motor. The stepper coils create a magnetic field when they are energized. According to Faraday's Law, the changing magnetic field induces a current in the coil. And according to Lenz's Law, that current will be in the reverse direction of the current creating the field. This reverse current is known as "Back Electromotive Force" or "Back EMF". This Back EMF increases the "impedance" or effective resistance of the coil. So Ohm's Law still applies - but to this impedance, not to the simple phase resistance. This impedance limits the current flow through the coil at the beginning of each step. A Chopper or "Constant Current" drive compensates for the back EMF by driving the motor with a higher voltage. It is not unusual to drive stepper motors at several times their rated voltage using a chopper drive. To keep things safe at these higher voltages, the chopper drive also monitors the current being delivered to the motor and "chops" it before it exceeds a pre-set level. By starting at a higher voltage, the chopper drive is able to deliver more current to the coils at the start of the step, increasing the available torque. In addition to adding torque at slower speeds, this also allows for higher top-speeds. Selecting a chopper driver and configuring it for a specific motor requires a good understanding of both the motor and the controller. This guide was first published on May 05, 2014. It was last updated on May 05, 2014.